I finally decided to get an Oculus Rift. The Rift was the first VR system I had tried but it’s only now that I decided to get it, after I had already gotten the Samsung Gear VR, the HTC Vive, the Playstation VR. Here are my thoughts on why I got it, and how it compares to the other VR systems. – how the Rift compares with other VR systems. Update: see also my review of the Oculus Touch! When I first tried the Oculus Rift at a demo, I was very impressed with the immersiveness and sense of presence. However, that same demo convinced me that there would be greater immersiveness from roomscale VR. So when I finally cobbled together an [inexpensive] VR-ready PC, I decided to get the HTC Vive. I was very pleased with it, despite the inconvenience of having to set it up and dismantle the tracking system every time I used it (because I use it in our living room, and I couldn’t stand seeing the cables from the base stations). I liked the fact that its games were truly different from games on the Gear VR or Oculus Rift, or on any other system I’ve tried. But what I didn’t know about was compatibility. I thought the HTC Vive had better compatibility because it could play HTC Vive games and some Oculus Rift games. 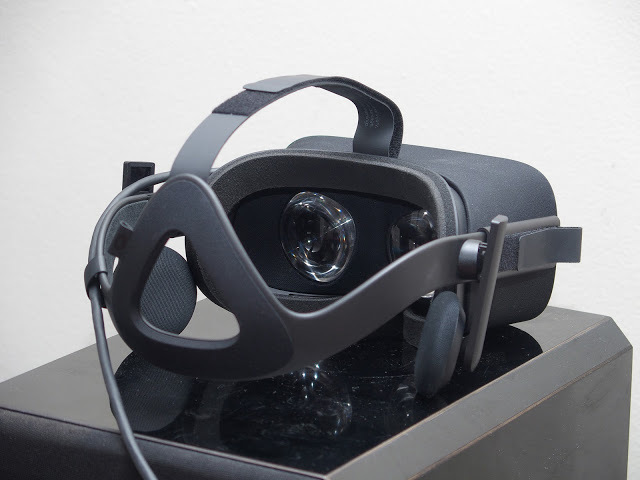 The Oculus Rift could play only Vive games that were also explicitly designed for the Rift. I later found out that this was not due to an inherent compatibility between the Rift and Steam games, but only because of the absence of a motion controller — which would soon be available on the Rift. At the time I was looking into the Vive, this was not at all obvious. If you ask sales reps for the Rift, they will insist that the Rift is not compatible with Vive games unless the game was also designed to be compatible for the Rift. Moreover, most VR games on Steam state that they are only compatible with the Vive. There are also people who own both the Vive and the Rift, which seemed to me to make sense only if the Rift is not compatible with Vive games. But the truth is that the Rift can run every game on Steam, subject only to controller compatibility. Reverend Kyle (Rev VR Studios) got the Oculus Touch dev kit and he was able to use the Rift and Touch with most of his Vive games, without any modification or the need to run any kind of compatibility layer (see Ep. 122 of his podcast). Meanwhile, Oculus announced the pricing of the Oculus Touch, which would bring the total price to about the same price as that of the Vive. I tried the Oculus Touch demo and it was pretty good even though the tracking wasn’t as robust as that of the Vive. Now that I knew that the Rift could play almost all Vive games, it made me reconsider the Rift. I had tried some Rift games on the Vive using Revive, including Feral Rites, Chronos and Damaged Core, and I liked them even though they weren’t roomscale. I would prefer a system that could play both Rift and Vive games. I calculated that if I sold my Vive and bought a [used] Rift plus added the cost of Touch controllers, it wouldn’t be a big difference. So around the time I got my Playstation VR, I decided to sell the Vive. And I found that I wasn’t satisfied with only the PSVR, so I got the Rift. The Rift comes in a handsome box suitable for use as a storage case for the Rift. 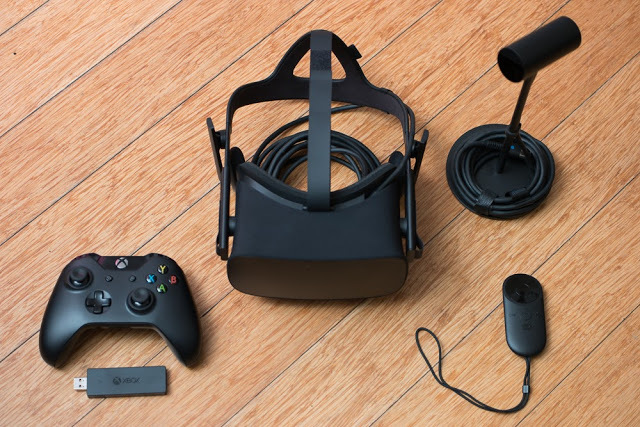 It includes the Rift headset, one Constellation sensor, the Oculus Remote, an Xbox One controller, a wireless USB adapter for the controller, and a USB extension cord. 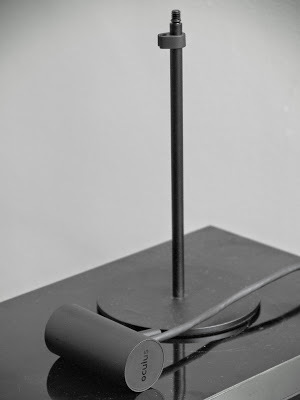 The sensor is a tilting camera mounted on a weighted stand with a cable that is about 2.5 m (~8 feet) long. The sensor can be detached from the stand and attached to any wall mount with 1/4-20 tripod connector. The remote looks sleek and has a minimalist design with clean lines. The middle of the remote is a button and the outer ring serves as directional buttons. Below the ring is a back button. What look like embossed signs beside the back button are actually also buttons themselves for volume (+ and – buttons) and a button shaped like the Oculus logo to go home. Besides looking cool, the shapes make it easy to locate and identify buttons by their feel, while wearing the headset. Following the minimalist theme, Oculus’ sleek black headset also has simple lines in stark contrast to the HTC Vive’s intimidating appearance. 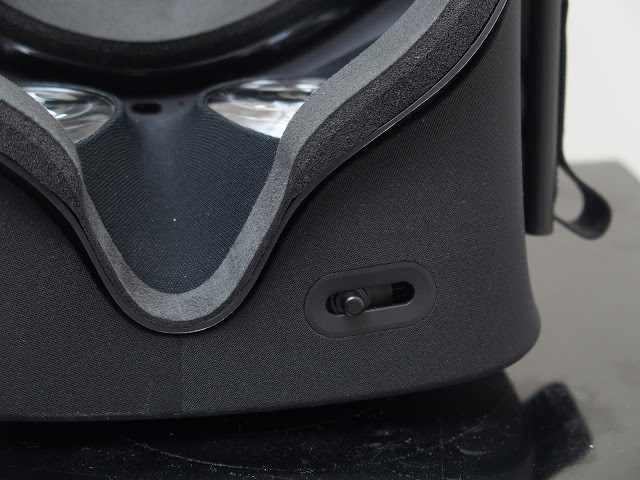 Unlike most other VR headsets, the Rift headset is covered mostly in fabric, except for the plastic face which covers infrared lights detected by the sensors. The rear of the headstrap has a triangular shape that cradles the base of your skull but which also houses infrared lights for the sensor when the user is facing away from the sensor. The headset features adjustable headphones with decent sound quality and surprising bass response. I would say they are comparable to Apple Earpods. The lenses on the headset are Fresnel lenses shaped somewhat like eyeglass lenses. They are surrounded by a stretchable fabric that accommodates the movement of the lenses as the interpupillary distance is adjusted by the switch below the headset. There is a proximity sensor above and between the lenses that detects when the headset is being worn. A small LED light beside the proximity sensor lights up to show that the headset is turned on. The facemask is removable for cleaning. 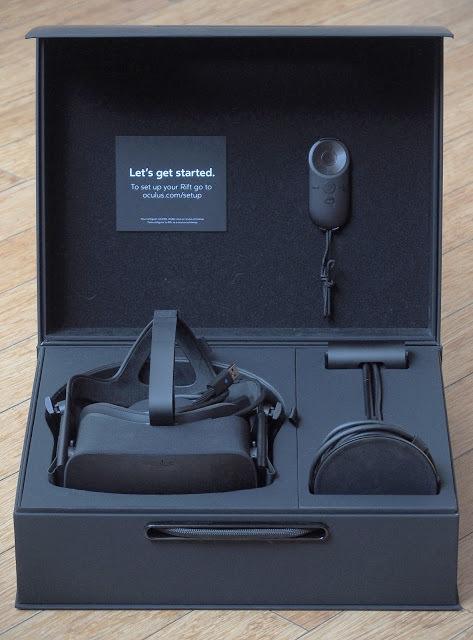 Among desktop VR systems, the Rift is theoretically the simplest to setup and requires the fewest cables and connections. First, you download the Rift setup software. Then you connect the headset, the sensor, and optionally the wireless adapter. The headset has only two cables: USB 3.0 and HDMI, both of which connect to your PC. The sensor uses USB 3.0. The wireless adapter uses USB 2.0 or 3.0. They are all powered by USB and don’t require an AC adapter. 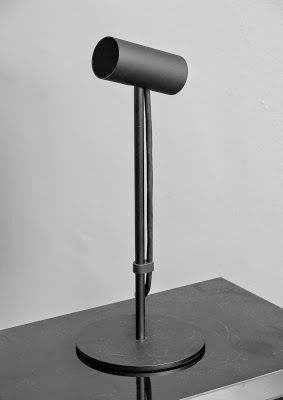 The sensor includes a weighted desktop stand. It only needs to be put on your table with at least 3 feet distance from the headset. Alternatively, the sensor can be detached from the stand and attached to any wall mount with 1/4-20 tripod connector. The first time you use the headset, you’ll be prompted to go through a simple setup where you enter your height and you stand while the sensor analyzes your position. If you later want to change your orientation (which direction you’re facing), you can do so through the menus from the headset. If you wish to reposition the sensor to a different height, the sensor can be recalibrated in the desktop menu. Although the setup is simple, I ran into some hiccups. When I first installed it, there was no audio coming out of the headphones on headset. It was not until I ran the Steam setup (not Oculus setup) that the sound was fixed (not just on Steam but also on Oculus games). Second, Oculus Home says that the headset connection is USB 2.0 even though it is connected to a USB 3.0 port. Nonetheless, the headset appears to be functioning normally. Third, I keep getting this popup saying that my computer doesn’t meet the minimum specs, even though according to VR Mark, my PC’s score is “Super” (with the basic test). I should also note that while I found the Rift headset to be more comfortable, I found it harder to adjust it to my vision. The only adjustment available appears to be the IPD (interpupillary distance), adjusted with a small switch on the bottom of the headset. But once you find the sweet spot, it’s not difficult to find it again the next time you wear the headset. 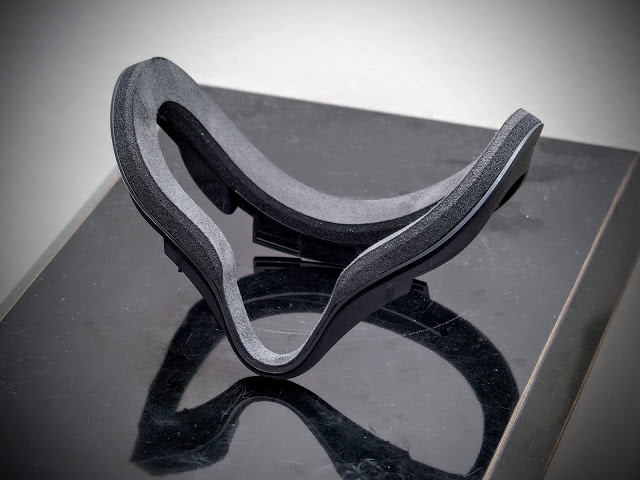 The Rift is very comfortable to wear and sits securely on your head without having to be strapped tightly to your face. The headstrap accommodates a wide range of head sizes, fitting over my 6 year old daughter’s head and my [large] head as well. I like the fact that the headstrap has a little spring to it so that you can remove the headset without loosening the straps, which avoids the need to reposition them every time you wear them. Using the Rift is convenient. I just plug in the sensor into the USB port, place the sensor on my desk, plug the headset into the USB port and HDMI port, and that’s it. If ever I change the height of the sensor, the setup merely requires me to re-enter my height and stand for a couple of seconds. On the Vive, one of my base stations is not permanently installed, so I have to set it up with a support rod every time I use it, and often I have to run the more extensive Vive setup which requires calibrating the height and tracing the boundaries of the play area. It is also possible to keep the Rift stowed away without much of a hassle, although I prefer to return it to its case to avoid dust. The disadvantage of the Rift’s simple setup is that you don’t see any boundaries for your play area, unlike the Vive. Moreover, when the Touch is released, it too will require a detailed setup similar to that of the Vive. Another consideration is that the Rift’s sensors need to be connected to your PC via USB. When Touch is released, you can place the second sensor in the opposite corner of your play area for 360 tracking, or add a third sensor for roomscale VR. However, this would mean more wires extending from your PC. On the Vive, the base stations are not connected to the PC and only need to be plugged into a power outlet. Here are what I noticed about the Rift’s optics. – The field of view appears to be slightly smaller than that of the Vive, especially if you use a thinner facepad on the HTC Vive. – There is a little bit of bluish fringing on bright images toward the top of the frame / lenses. – The “god rays” are very prominent and more distracting than I thought. I can easily see them anytime there is a light object on a dark background. It makes the lenses seem like they are smeared with fingerprints, even though the lenses are actually clear. The Vive doesn’t have god rays but you’ll see concentric rings (a reflection of the Fresnel lenses). To me, the concentric rings are less distracting. – You can see a little bit of light leaking around the nose area. Sometimes I use this to peek through when I need to see outside the headset. – There is slight distortion in the lenses, which is most noticeable in static scenes, where moving your head left to right, you can notice the image stretching slightly. – When looking at near objects on the Rift, I feel like I get crossed-eyed. This seems to happen less often on the Vive. 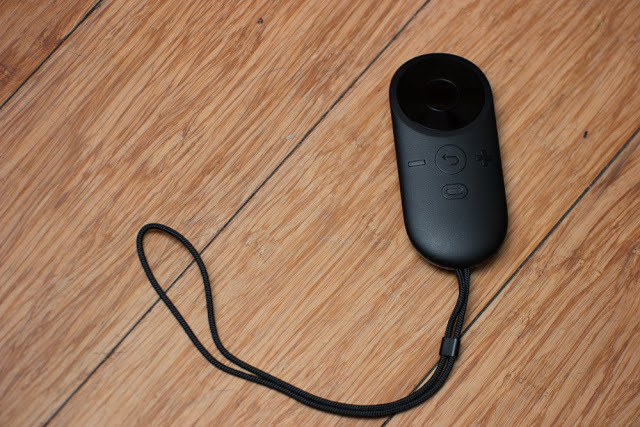 Compared to the Vive, the Rift’s tracking area with one sensor is noticeably narrower, and has a cone shape, with around 90 degrees coverage from the sensor. I noticed that when you move farther from the camera, the tracking becomes a little less accurate. I could be standing still and the sensor is not moving but the display will seem to “swoon” back and forth, which can be nauseating. There is also occasional jumping, when the display will suddenly change a little bit, especially when turning from facing the camera to turning away from the camera. I hope having two sensors will fix these tracking issues, but I don’t know for sure until Touch is released. Right now, the Rift uses just the Xbox One controller or the Oculus Remote. Neither the Oculus Remote nor the Xbox One controller have motion tracking capabilities. The controllers work fine for cockpit games, but for almost all other games, the Vive’s motion controllers are far better and more immersive. However, Oculus Touch will put the Rift on par with the Vive. I’ve tried Oculus Touch and they work very well. In terms of ergonomics, I like them better than the Vive controllers. On the demo I tried, the tracking wasn’t as good as that of the Vive (when I turned around, the controllers would lose tracking) but that could have been because the sensors were setup side by side. According to Oculus, it is possible to have 360 tracking with two sensors (a second sensor is included with the Touch) if they are placed at opposite corners, and roomscale VR is possible with three sensors in a triangle configuration. I plan to try it with two sensors first, and then get a third sensor if two sensors aren’t good enough for Vive roomscale games. The Rift currently has several very good games, such as Lucky’s Tale, Chronos, and Damaged Core, although I don’t find its current library all that impressive because many of the games are not that different from conventional non-VR games. However, when Touch is released, there will be games that use motion controls which will be more immersive. I’m looking forward to games such as The Unspoken, Lone Echo, Robot Recall, and many other exciting titles for the Touch. Most importantly, the Rift will gain access to most of the Vive’s library. Update: I now have the Oculus Touch. Here is my review of the Oculus Touch! Using the Rift with Steam is simple. You just need to activate Steam beta, then with your Rift plugged in, run SteamVR. You then go through the same setup process for the Vive. 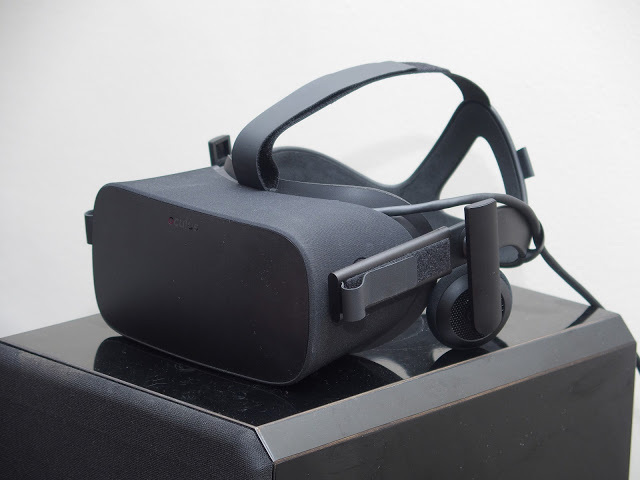 Once setup, the Rift can play any game on Steam, subject to controller compatibility. Even games or apps that have incompatible controls can be launched, but you just won’t be able to do anything in the game. But it shows that the Rift will indeed be able to run Vive games. I should add that some people who don’t want to support Oculus / Facebook’s business practices. But that’s ok — you could simply get your games from Steam/Valve. Another pragmatic reason for buying games from Steam (if available on both Oculus Store and Steam) is that it’s easier to get a refund from Steam if you’re dissatisfied with the game for any reason. The Rift has some apps for viewing 360 photos and videos. The Oculus Video and Oculus 360 Photos app can be used for watching 360 photos and videos, but they appear to be limited to 2D 360 for now. There are also 360 video platforms such as Jaunt, Littlstar, Within (formerly Vrse), Vrideo, Hulu, and Discovery VR. Strangely, its little brother the Gear VR actually has more VR viewing apps. Moreover, the Gear VR can be used for watching 360 Youtube videos (using the Samsung Internet app) and special events (through NextVR), whereas those apps are not available for the Rift. You can also watch Netflix on a giant virtual screen on Gear VR, but I didn’t see an equivalent app for the Rift. Now that I have the Rift, here’s how I think the primary VR systems compare. 1. The Samsung Gear VR is potentially the cheapest if you already have a compatible Samsung phone. It’s great for photos and videos, and casual games, but because it has no positional tracking, your level of immersiveness will be limited. 2. Google Daydream looks interesting if it gets adequate developer support. I’m particularly interested in the motion controller. 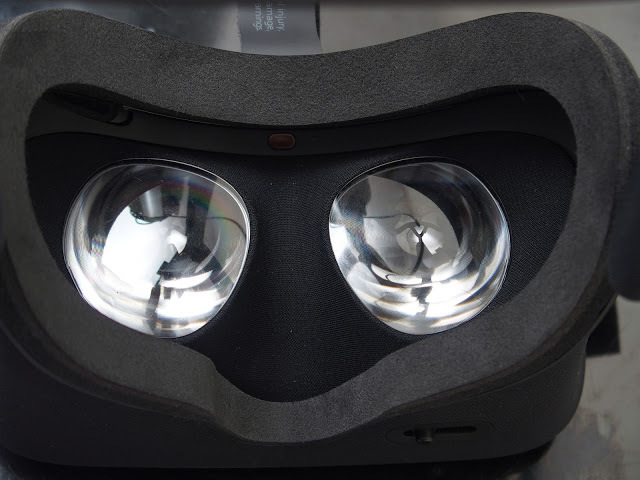 But as with Gear VR, I think it will be useful primarily for viewing 360 photos and videos, and casual games. 3. The Playstation VR is qualitatively different from the current generation of mobile VR systems, and will indeed provide ‘true’ VR, with positional tracking. Technically, it’s not as good as the other desktop VR systems because of the more limited tracking for the headset and the motion controllers. But it appears that it will have the most polished games, and may grow to have the largest number of users, it if hasn’t already overtaken the other VR systems. 4. HTC Vive has the best tracking for the headset and its motion controllers. As 2017, it has the widest variety of games. Many of its games use roomscale VR and use VR in ways that are different from those on the Samsung Gear VR, Playstation VR or Oculus Rift. On the other hand, many of the games are indie games with lower production values, which might not appeal to some users. Nonetheless, if you want the best VR tracking quality over the widest area, there is currently nothing better than the Vive, in my opinion. 5. Oculus Rift’s tracking system is now about as good as that of the HTC Vive but covers a smaller area (still roomscale). 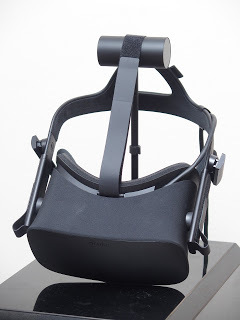 The Rift’s key strength is its software. They are generally more polished that those of the Vive, and thanks to Facebook’s $500 million investment in software, users can be assured of a supply of high quality games. With the release of Touch, . – Samsung Gear VR (2016 edition, Consumer Edition). Oculus Guardian: is Oculus shifting toward Room-Scale? Friendly FYI here, there is something wrong with your formatting. I have opened this page on my S8 using Samsung’s browser, Chrome, and Opera (In desktop mode). On all of them your paragraphs comparing the systems, the one I most want to read of course, appears over the other paragraphs in a compressed space making it almost completely unreadable. I tried cutting and pasting that portion alone but that didn’t work well. Before that paragraph I was going to ask for more about why you switched, other than the compatibility issue. Seems like the Vive is pretty darm compatible, so I am looking for more an explanation of that and less of explaining all the parts of the Rift. Perhaps that is covered more in the unreadble paragraph. Would like to read that if you fix it.